U.S. Fire Arms Mfg. Co. (USFA) in Hartford, CT, proudly announce the USFA/SASS Single Action Revolver. You can now own a piece of history – US Fire Arms Co. and the Single Action Shooting Society have teamed together to bring out the World Famous Single Action Revolver. Each USFA/SASS Single Action Revolver will be built to specification and features an Old Armory Bone Case™ and Dome Blue™ finish, Old Armory Bone Case™ Hammer, black hard rubber checkered grips, Cross-Pin frame, Square Notch Rear sight, and Square Front Blade sight. Also each is marked with a special roll engraved SASS name and SASS Marshal into the left side. Choose from three calibers – .45 Colt, 44-40, and 38 Special. Three barrel lengths – 4-¾”, 5-½”, 7-½” – with ejector. A wide choice of grips are available. “US” Black Hard Rubber Checkered grips standard. Other grips available are the “US Ivory” (faux ivory) Smooth Grips, White Hard Rubber Checkered Grips, and two piece Walnut Grips. 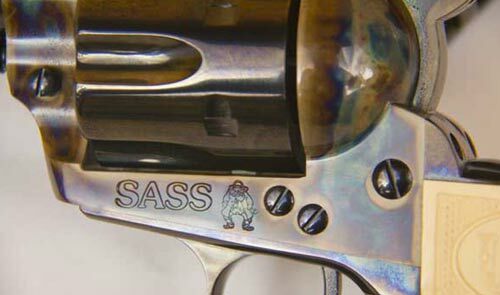 Customers may also have their SASS Alias or SASS Number “Hand Engraved” on the Back Strap, to further personalize their revolver. All USFA/SASS Single Action Revolvers are available only through SASS and are shipped and warranted through Long Hunter Shooting Supply, official licensed dealer of USFA products. • Replace factory flat “hand” spring. The frame is drilled and a “Ruger style” coil spring is installed for reliability. • Factory flat “trigger/bolt” spring is replaced with a wire spring for added strength. USFA® is the largest firearms manufacturer in Hartford, Connecticut. Best known for their historically accurate production of revolvers, automatic pistols and rifles; US Pre-Wa r ® , Plinker.22, Omni-Potent® & Bisley Model revolvers, Model 12/22™, Double Eagle™, Shooting Master®, Sparrowhawk™, Rodeo® Gun, Gunslinger®, Custer Battlefield Gun, Maxim® Silencers, Model 1910 Autos, Model 1911 Autos and Super 38 Automatic pistols. do you have to be a sass member and how much dinero?